The Baltic Sea Region covers nine countries entirely (Belarus, Denmark, Estonia, Finland, Lativa, Lithuania, Norway, Poland and Sweden), and two countries partly (Germany, Russia). For Germany, only the north-eastern territories are part of the BSR (i.e. the Länder of Berlin, Brandenburg, Bremen, Hamburg, Mecklenburg-Vorpommern and Schleswig-Holstein, as well as NUTS-3 unit of Lüneburg in Niedersachsen). For Russia, only the westernmost regions are part of the BSR. Eight countries are European Union member states, while three countries (Belarus, Norway, Russia) are non-EU countries. For statistical purposes, NUTS-3 and NUTS-2 regions are the most important administrative levels on which this territorial monitoring system is built upon. For the non-EU countries, similar units are being used. For Norway, NUTS level 2 corresponds to landsdeler and NUTS level 3 to fylker. For Belarus and Russia, oblasts are being used equivalent to NUTS level 2. 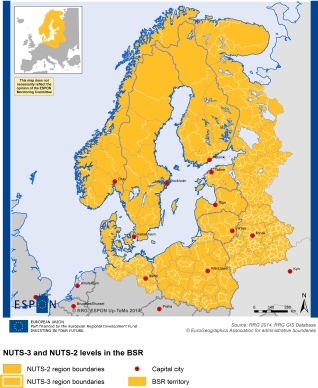 For urban monitoring, a sample of 80 major cities in the Baltic Sea Region were selected in addition to these NUTS level 2 and level 3 entities.